Listening to the brilliant new podcast ‘This North Works’ on my commute one morning, a platform which illustrates the potential for successful and enriching careers in the North of England, I was introduced to the world of Simon Fogal. The Drummer for alternative post-rock band I Like Trains, Founder of I Like Press - a concept born almost a decade ago to help promote burgeoning music careers, and the man behind Leeds Indie Food and Chow Down - world-class food and lifestyle festivals, that aim to forge community and collaboration across Yorkshire's independent food scene. I am sure my desire to reach out to Simon was in some part driven by my affinity with Leeds. Having studied and lived in the city for 5 years, I can vouch for the vibrancy and authenticity of the city’s most exciting dining concepts and alternative cuisines. From Laynes coffee house, to Bundobust Indian Street Food, and Northern Monk Brewery, some of my fondest memories from my time in Leeds were formed sitting around the table, sampling the best food and drink from across the region. Having had the opportunity to speak with Simon it struck me that no part of his life and career can be neatly compartmentalized. Each part informing the next, while simultaneously providing him with the skills, networks and know-how to make every chapter of his work a success. 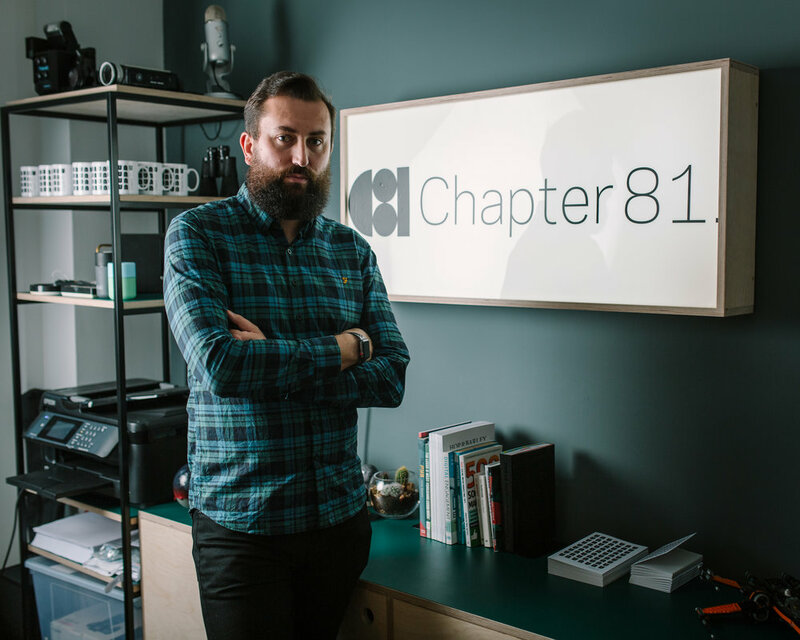 His latest venture, Chapter 81, a PR & Communications agency based in Leeds, blends more than fifteen years of lifestyle, hospitality and public relations knowledge to cultivate bespoke events and experiences in the North. From musician, to PR specialist, to founder, we delved deeper to understand the many chapters that have shaped Simon’s life; his passions, projects and pastimes. We discussed his fondest memories as a member of I Like Trains, how it feels to be at the helm of Leeds Indie Food Festival, and why becoming an expert in your craft is pivotal for progression. What made you want to start a band? As soon as I started playing the drums it was about finding a way to play them on a stage. I started quite late (13 years old) and I think that joy of being a part of something is such an underrated feeling. I have played in many different bands, played drums for musicals and even for an annual ballet showcase. I used the instrument to help battle though some minor school bullying and basically took the frustration out on the drums, it is a massive way of letting tension out and keeping fit! When you have that connection with a group of people through music, it is something special. I originally went to university with the idea of graduating as a producer and recording bands, but throughout the first couple of years I really missed being on the other side of the window and playing music. I met a bunch of guys making music and they invited me to a studio and then we hit it off and we used the course to help record the early demos. As soon as we realised that we had a sound, you know one that is a little like marmite, it was full attack on doing that as our career. What have been some of your best experiences of being in a band? I have many memories from the early days in the what I call, “the understanding what being in band should be” stage. We have had a blast, we have cried, seen the band’s kids grow up, been to their weddings, we have been through a lot together. My parents even told me they were divorcing as we were on a motorway in Germany on tour. Big life moments. One tour in particular was long, maybe 3 months in total (with gaps) but we started from Leeds and drove all the way to Madrid via a small French tour, over to Italy into Austria and back up through Germany into Denmark and Sweden and back into Holland. Memories from that tour include getting the van stuck in an underground carpark, being robbed at gunpoint and many a tantrum/ hotel room argument. Most memorable day for me was launching the Pledge campaign (crowdfunding for musicians) for our second album, once you get dropped from a record company, you feel quite low in self-esteem, so that was a huge boost that people cared about us still. We met the target in hours and it was memorable as I was off work with a broken leg. Thinking about it, I actually missed the first tour of that album due to the 6-month layoff from the broken leg, I still went along and sold merch. As a musician, how has your musical career played a role in shaping your work in Public Relations and Events? I was always a quiet one, listening and learning as you go, picking up skills etc. Once the record deal went, the funding for our PR did, so I picked it up to keep the noise up. So for me this is very much linked to where I am now. Without ILT (I Like Trains) , I Like Press wouldn’t have been a thing. In truth, I was the person who was dealing with journalists via the PR on tour, you keep a record of their details, so was a natural progression really. I actually enjoyed doing the PR so it was really rewarding when you see reviews in print. After meeting Brew Records (RIP) it was decided that we would join forces and pull resource to helping each other out. It took a couple of years but people were coming to you to asking you to get their bands in print, it was the reward and it grew organically. My broken leg chapter was also the time I picked up our first festival client for I Like Press, and that really felt like a change in what we were doing in the music PR world. What are some of your favourite music genres and what have you been listening to recently? This is a tough question. I have been listening to lots of music recently as we have been in the studio and searching out certain drum sounds to have in mind. Beirut, Grizzly Bear, Christine and the Queens, The National. This is nothing to do with how the new album is going to sound. The new album is probably our darkest with a political anger to it. I think if you checked my release radar it would be that sort of thing with maybe Four Tet, LCD, Radiohead into something like Paramore (a guilty pleasure). Working the ILP office it was always dominated by different people, so went with the flow a little bit, from sad songs, to modern hits. What is it like work in the music industry, pros and cons? Music industry is a tough place. We only really experienced it full time for a couple of years and that was an amazing time. Tough in that you have some seriously long hours. Especially on tour, where you quite often have to find that inner strength. I remember a fly in show in Athens and I managed to pick up food poisoning. I managed to get through the show but after was pretty sick. The next day we were playing with Wild Beasts in Leeds. I still have no idea what happened at the gig or how I did it as I was pretty ill. Pros – def discovering the world. From Austin and the East Coast of USA, Moscow, deepest forests of Poland, to most of Europe, which I would never have seen if it wasn’t for the band. Those aren’t places you would go on holiday. What were the early days like at I Like Press and how did you grow the business? Starting a business is tough. The early days involved building up clients and proving yourself whilst having another full-time job. I had a mortgage you see, so couldn’t do that thing where you just stop. It was a gradual thing. Redundancy helped me transfer from the regular payslip to being your own boss. I had gone from full-time into part-time work first, then using that final six months to grow a client base. It was an amazing feeling stepping into an office for the first time without having to do two jobs. Growing the business happened pretty fast once doing it full time. Picking up small jobs and learning on each job. I worked on albums that when you started sending out to press, had already been received by someone else months ago and little mistakes like that from the smaller labels, that is what pushed me to do festivals, venues then move into food. It was that time I found the love of helping smaller businesses out and get a true buzz from it. I like Press recently diversified into two separate channels - Chapter 81 and For The Lost, what were the reasons for this change in tact? I had 9 great years as I Like Press, which is a long time really. In all honesty, I think it just met a natural end with both Directors wanting different paths. Due to the success of the food side, it was becoming increasingly hard to co-run ILP (payroll, HR, accounting, invoicing etc) then be managing food events on weekends. I was starting to miss the day-to-day PR side of it all and decided a different way of working was needed, for my personal sanity more than anything. The evolution is me growing up. Chapter 81 is that different way of working, it is that more mature company which clients will benefit from. It was a back-to- basics approach, what do the clients actually need and then linking them to that. Chapter 81 is a pool of freelancers and myself, all pulling together. My working patterns are much improved and we work around each other. It is quite exciting what we could achieve really and you can pull in some PPC help, boost some social content when you need it, you can bring in extra resource by the hour and make it work. Are there any clients you especially liked working with at I Like Press? We always tried to do pieces of work that complimented the business, this of course was harder in the end. I will miss the music festivals, Best Kept Secret in Holland was an absolute joy to work on and we got to spend a bit of time in the Netherlands, which I love. One of best PR moments was when The Libertines headlined, and this was their first show back and played some new songs, which happened to go viral on the world stage. It was that media rush you get, and we nudged it along! I also miss Beacons Festival in Skipton but was always a challenge, due to location and the apparent unique weather system in the valley and you spent more time writing press releases about the rain and hurricane Bertha than about the amazing performances of The Horrors, Daughter and Action Bronson. Working with Leeds Business Improvement District (LeedsBid) was a moment where you realise that you can actually do this to a bigger level. You pitch an idea and they don’t laugh and I have been there from the (almost) beginning for them. From helping to establish Leeds International Festival in a short space of time to working on the MOBO awards and more. I am pleased to work even more with LeedsBID as Chapter 81. What are your proudest moments from I Like Press? People always assumed ILP was a huge success. There was always a great pride in that. To me it was that feeling of taking an idea and turning it around. From the hard, early days working other jobs to a business turning over £300k. We always put clients first and never nominated ourselves for awards for the work we did, so seeing clients win awards was a proud moment. Launching Bundobust, Belgrave, Northern Monk are all stand out plus the birth of Leeds Indie Food. Where did the name Chapter 81 come from? The naming of a new business is always tough, from checks on Companies House to the social handles. I spent a long time on this. It was obvious this was going to be a new chapter and with everything I had done, it probably feels like Chapter 81 but the number means something else. Any advice for people wanting to work in this industry? Leeds has a lot of digital agencies and some really great companies out there. Depending on when you are wanting to get into the industry (University) look at the ones who have good Intern programmes. One thing that should be noted is that PR is quite often sat doing spreadsheets, emails and reading up/ researching. The pay-off is going to the events. From my experience you need to get out there and meet people, the one thing I took from University was to network and build your network. It is no good writing an amazing press release if you don’t know anyone to send it to. Learn about strategy, just because you can take a nice picture on your phone, doesn’t automatically mean you are good at social media. earning what, when and why you post is more important. Ideas. This is hugely important and having the craziest of ideas will help you refine the less good ones. Network, Strategy and Ideas. 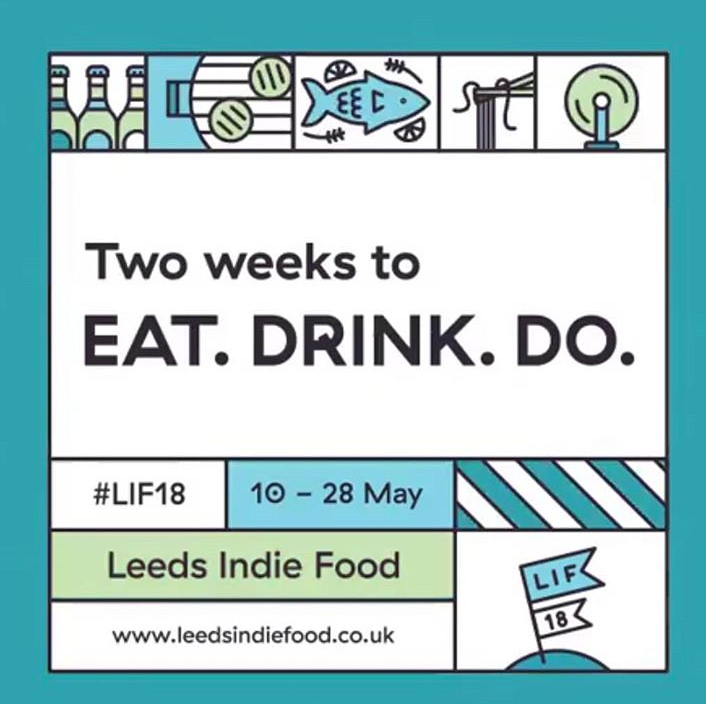 Taking over the running of the hugely popular Leeds Indie Food is no easy feat - how did your experience prior to this help you in evolving and growing the brand? In many ways it felt like the time when the band lost the record deal. Initial shock and oh my god my life is over, to lets just crack on. I have been involved since the beginning and I was almost in transition from year 1 to now, with doing a lot more than I was meant to. After the initial shock, I spent a week thinking if I could do it. But I really did think that it would be missed and at the time, indies needed that boost with a few higher profile closures. One thing I am working on, is to make it a business in itself, one that supports businesses when they need it but also giving customers things to do, all year round. Every year it only just survives, but with an added events calendar and a more popular Eat North, this has helped. Can you tell us a bit more about Leeds Indie Food and your personal highlights so far? The feeling in the city for the first one was something you can’t buy. It was magical. I had a similar feeling on the first event this year. The idea to get as many businesses to come together is always a challenging one, time consuming but rewarding. Events like the Norse 50 course dinner is still a highlight, to the big Leeds Feast in year one and #FindtheForest is a massive highlight for me and many others. If you look back at the highlights gallery (food.ilikepress.co.uk) you can get lost in a world of food and proudly say, I did this. What does it take to create an event of this scale? I am not sure what people think happens. But It takes a lot of inner strength and belief but also a lot of emails and meetings. Work has begun on 2019 which normally starts in November. The first events normally go on sale end of January and roll out till March. From writing participation agreements, managing the ticketing, event submissions and also pushing venues to do events. It is a mammoth task. That is one side but the other side of managing customer expectation and announcing it all is a fun process, then writing the magazine and then making sure they all sell out. 86 events, 27,000 people attended events in 2018 bringing in an estimated £750,000 to the indies but also 300 pieces of media coverage and a huge social media impression of nearly 3million. This year kicked off with a series of talks around sustainability, why is this such an important cause for you? The launch event for the festival or as I call it, the “One Month to go” event, was about trends in indies. Sustainability is huge for everyone now and I was already passionate about this subject. We had healthy debates with some big Leeds indies (Ox Club, The Swine That Dines, Home etc) about no-shows at restaurants to the vegan debate. The feeling in the room was pretty special and to initiate those chats was incredible. From food waste to coffee cups to packaging, 2019 will see a few more themes coming through and as a group we can all be looking at helping each other with a lot of the issues we face. I have to ask, what is it about Leeds that you love? I was born in Leeds but moved away when I was around 7. When I returned in 1999, it was a very different place to what we have now. After University, we hit the global financial crisis and it wasn’t till 2012/2013 where we saw a huge rise in both retail offering in Leeds and the emergence of an indie food scene. Those early days from Laynes first opening, to trying to squeeze into the original Friends of Ham on a night were great. I also loved the initial announcement of Belgrave Music Hall. Everyone asking why the hell they were opening up that end of town. Now you see it and it was an amazing move. I love the streets like Mill Hill (Bundobust, the new North Taproom and Tapped) and North Street (The Reliance,The Brunswick, The Swine That Dines). I also love Northern Monk and the Holbeck area with Cross Keys, Midnight Bell, Foundry. Just real quality spaces. Leeds has a blossoming indie food scene, what is it about the city that makes it stand out from say Manchester, Liverpool and even London? I think we were so far ahead of the other cities for indies then they all caught up. The main thing is community, I am not sure you quite see it in other cities as much as Leeds. Businesses are always wanting others to succeed. I want our community to be leaders in innovation and shining a light on the city as it starts a new journey with expansion (just need to sort the transport links out). Collaboration with Halifax’s Piece Hall in the form of Chow Down proved to be a big hit, why is it important for you to work with initiatives in the wider Yorkshire region? We were asked last year to visit The Piece Hall and look at doing a foodie event but when the others left Leeds Indie Food, we hadn’t submitted a full pitch. One of the first things I did when I took the reins was return and enlist the help of New Citizens and then Chow Down was born. What we have achieved in year one is beyond our wildest imagination. 120,000 people came to the four weekends. This gave Halifax a bit of swagger and you really felt the excitement in the air, it has helped put Calderdale on the map and they are reporting massive tourism figures too. It has been a huge learning curve though and 2019 will see this grow into the best celebration of food and drink we can possible do. In your opinion, what's are the best ingredients for a successful event? Collaboration is def a key ingredient but also trying something new. The Man Behind the Curtain collaborating with Laynes in year 1. Bundobust, Ox Club and Prashad all pairing up. They create stand out, one-off events. Getting people to work with others that they a) probably have never heard of or b) wouldn’t be seen in or even c) next door neighbours. 2019 I am going to try a little experiment on collaborations too…. Watch this space. What foodie events or cities do you think are worth a visit? Cities = Bristol (obviously) but I also love the Kelham Island part of Sheffield now. I think you can find some proper gems of food in most cities now. Event wise, The Lost Village have an amazing food offering in a music setting and I love that this is becoming a big thing now. Who wants to eat rubbish food at a music festival? We tried to help Leeds Festival on curating a bit of a Leeds area, I wrote a plan and then submitted it but it was a shame that the group running the festival didn’t want to pay someone to curate it but instead negotiate a fee from the vendors themselves. We try really hard to get good deals for vendors as we know they are small businesses, like ourselves so on that occasion it wasn’t going to work. We have so many events now but I love events put on by real foodies and not people who are trying to capitalise on the next hot thing. You want to see real passion, from the organisers/ the vendors from it all. GRUB is high on the event list of must go-to but surely you have all been there? Any personal favorites from this years Leeds Indie Food? Really hard to pick favourites. The Bundobust, Prashad and Ox club event was amazing but then #FindTheForest was stepped up a gear. I loved how Parmstar treated people to an amazing night of Parmos at Laynes plus the Junk Food Supermarket opened up a lot of eyes on the issue of food waste. If you could eat anything right now what would it be? Right now. I need a massive bowl of Ramen. Come on Fu-Schnikens….. If you could sum up Leeds food scene in three words what would they be? Not just streetfood. Haha. Actually vibrant, collaborative and tasty af.